Time has passed since Alphamon appeared and restoration has begun in Odaiba. When another infected Digimon - an Ogremon - appears and begins to wreak havoc on Odaiba, Mimi and Palmon spring into action. But in their haste to show the world that there are good Digimon, their battle brings about unforeseen consequences. The adventure now evolves once again... Special Features A Look Behind-The-Scenes At Directing The Voice, Cast Of Dig..
Tai and his friends are haunted by the infection that resulted in Meicoomon destroying Leomon. What could have caused it? When did it occur? Now, all of the Digimon are quarantined, in hopes that answers can be found and the infection can be stopped. Unfortunately, one of the quarantined Digimon is already showing symptoms. The adventure now evolves once again... Special Features English Premiere Panel At Anime Expo 2017..
Own Digimon - Digital Monsters Season 1 to 4 DVD from Deff, DVD, Blu-Ray & 4K Video Specialists - Free UK Delivery..
Own Digimon Adventure Tri - The Complete Movie Collection Blu-Ray from Deff, DVD, Blu-Ray & 4K Video Specialists - Free UK Delivery..
Own Digimon Adventure Tri - The Complete Movie Collection DVD from Deff, DVD, Blu-Ray & 4K Video Specialists - Free UK Delivery..
Own Digimon Adventure Tri - The Movie Part 1 Collectors Edition Blu-Ray from Deff, DVD, Blu-Ray & 4K Video Specialists - Free UK Delivery..
Own Digimon Adventure Tri - The Movie Part 1 DVD DVD from Deff, DVD, Blu-Ray & 4K Video Specialists - Free UK Delivery..
Own Digimon Adventure Tri - The Movie Part 2 DVD from Deff, DVD, Blu-Ray & 4K Video Specialists - Free UK Delivery..
Own Digimon Adventure Tri - The Movie Part 3 DVD from Deff, DVD, Blu-Ray & 4K Video Specialists - Free UK Delivery..
Own Digimon Adventure Tri The Movie Part 4 - Collectors Edition Blu-Ray from Deff, DVD, Blu-Ray & 4K Video Specialists - Free UK Delivery..
Own Digimon Adventure Tri The Movie Part 4 DVD from Deff, DVD, Blu-Ray & 4K Video Specialists - Free UK Delivery..
Own Digimon Adventure Tri The Movie Part 5 - Collectors Edition Blu-Ray from Deff, DVD, Blu-Ray & 4K Video Specialists - Free UK Delivery..
Own Digimon Adventure Tri The Movie Part 5 DVD from Deff, DVD, Blu-Ray & 4K Video Specialists - Free UK Delivery..
FUTURE Digimon Adventure Tri The Movie - Part 6 Collectors Edition Includes: Double Walled Slipcase, BD Case with Reversible Sleeve, 1 x BD disc, Poster and set of Art Cards. The end of the world has begun. The rampaging Meicoomon, now fused with Gatomon, has changed into the powerful Ordinemon. As foretold by King Drasil, the Digital World engulfs the Real World. Confronted by impending doom, the DigiDestined resolve to face it head o..
FUTURE The end of the world has begun. The rampaging Meicoomon, now fused with Gatomon, has changed into the powerful Ordinemon. As foretold by King Drasil, the Digital World engulfs the Real World. Confronted by impending doom, the DigiDestined resolve to face it head on. Homeostasis, in order to deal with the uncontrollable Ordinemon, executes the final plan for the Real World. To prevent the coming destruction, the DigiDestined and..
Own Digimon Digital Monsters Season 1 DVD from Deff, DVD, Blu-Ray & 4K Video Specialists - Free UK Delivery..
Own Digimon Digital Monsters Season 2 DVD from Deff, DVD, Blu-Ray & 4K Video Specialists - Free UK Delivery..
Takato Matsuki, Rika Nonaka, and Henry Wong are children who, on one fateful day, received real Digimon, unlike the imaginary ones in the card game they play. 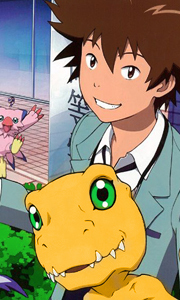 Each of the children, or "Digimon Tamers", have their different views on how Digimon should be treated. But when other Digimon begin to appear around Japan, they must put aside their differences to fend off both the digital intruders and those who seek to destroy all Digimon! Ta..